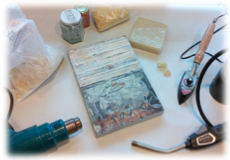 One of the lesser-known painting techniques we occasionally come across in the Gallery is know as Encaustic. The medium actually dates back to the 1st Century, and although it has evolved somewhat over the Centuries, in its simplest form, the Artist adds colored powdered pigments to melted beeswax to create a thick, pliable substance that can be applied to wood, canvas, or paper. A number of metal hand tools and brushes are then used to spread the “paint” creating the image they are composing. If the “paint” cools and hardens prematurely, the artist can use a heat gun or a woodburning iron to soften it so that it can be further manipulated. Historically, Encaustic has been used to create everything from religious icons to mummy portraits, but the technique has also been used by many 20th Century Artists including Jasper Johns. The attraction for an Artist is the ability to shape and old the colors, creating a textural quality to their work that would be difficult to achieve with more conventional media. 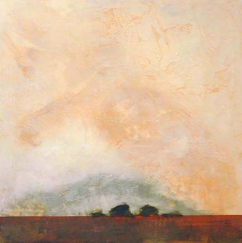 At the Gallery, we presently have a number of Encaustic works by contemporary artists John Baughman. Why not plan to stop in some time to get a first-hand look at this beautiful technique.